Who are you to say to me? You want to know what’s real for me? Being an individual, being free. In our relationships far and near. It’s the heart of us and we. In sunshine or in showers. It’s the best that we can be. Love is you and me. Be proud of who we are. Here from near and far. It’s Love that sets us free. We’re every colour, creed and style L. G. B. I. T.
There is no need to hide. Being who we want to be. With friends on every side. We’re Queer, we’re Proud, we’re Out. Amnesty International are holding a day of global action in solidarity with persecuted gay & bi in Chechnya. With regard to the global day of solidarity, Stonewall and Amnesty UK are organising the action in London, which will be taking place outside of the Russian Embassy, from 11am-1pm on 2 June. As part of the action, we will attempt to deliver Amnesty’s petition (supported by Stonewall), which calls for an end to the arbitrary detention, torture and killing of gay men and those suspected to be gay, to the Russian Embassy. 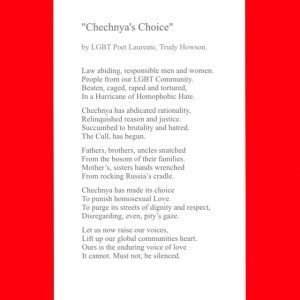 LGBT Poet Laureate Trudy Howson will be reciting the poem she has written for Chechnya, showing solidarity at this time. We hope to see you there. 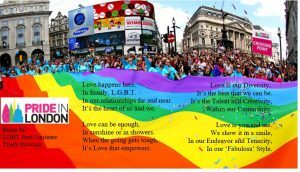 This inaugural post was devised by Camden LGBT Forum to promote LGBT poetry in London and the UK. The name of the first LGBT Poet Laureate will be formally announced during LGBT History Month, February 2016. Camden LGBT Forum is a charity that supports local LGBT residents. The Arts is a powerful tool we use to celebrate diversity and promote cohesion amongst our communities. During the last six years our “INCITE” Poetry event has been paving the way for LGBT talent to foster positive change through spoken and written word. 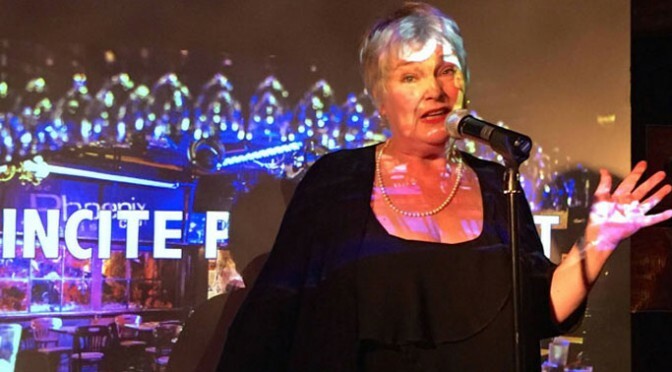 The recipient of the title, “First LGBT Poet Laureate” is Trudy Howson. The term of the appointment is for three years. During this period she will be expected to. 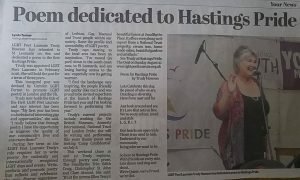 Write poems for nationally and internationally recognised LGBT days and events. Celebrate our style and culture. Encourage LGBT people of all ages, nationalities and types, to read, write, watch and listen to poetry.